Review: "Black Crowes, The: Warpaint-Live (DVD)" - Sea of Tranquility - The Web Destination for Progressive Music! 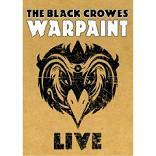 Essentially the video replica of the recently released 2CD set Warpaint-Live, this DVD lets you view 'up-close-and-personal' this hot performance from The Black Crowes as they perform their entire Warpaint album plus a few other rare tracks and covers. Recorded live at the Wiltern in Los Angeles, California on March 20, 2008, this show is proof of the musical prowess of this band, as the boys launch into nearly 2 hours of ripping blues, Southern Rock, jam band improvisation, and heartfelt gospel. If you've heard the CD set, you'll know exactly what to expect, so I won't go into great detail on this as we've already reviewed that release, but I will comment on the absolutely stellar guitar work of Luther Dickinson throughout this concert. Not only is he a great lead & rhythm player, but his slide guitar work is some of the strongest you will hear today outside of the two guys in the Allman Brothers Band (Mr. Haynes & Mr. Trucks). His inspired playing fits in right alonside the meaty rhythms and lush chordal work from Rich Robinson (who also lays down a mean solo from time to time as well), and on a whole the band is very tight and energetic throughout the set. Lead vocalist Chris Robinson of course is the focal point, looking like a young John Lennon from the Sgt. Pepper days with his long hair and beard, but man can this cat sing! His powerful, passionate delivery on "Walk Believer Walk", "Oh Josephine", and "Whoa Mule" are stirring enough to send chills up and down your spine, and coupled with the gut wrenching slide work from Dickinson, they make for a potent combo. The sound and video quality here is top notch, though I'm surprised there are no bonus features to speak of, not even some interviews with the band, which would have been nice. Overall though this is a rocking set from one of the premier Southern Rock/Jam/Blues Rock bands of the last two decades, and they keep getting better ladies and gentleman.